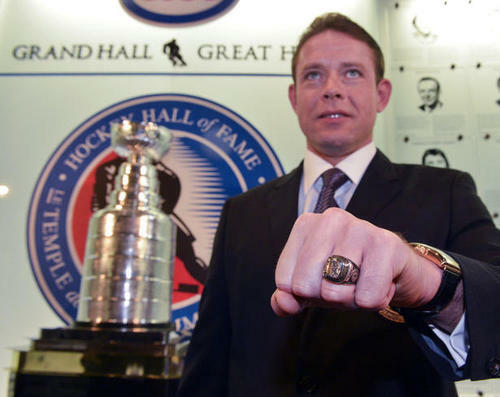 Last night, Pavel Bure was one of four players inducted into the Hockey Hall of Fame. He’s in the Hallowed Hall, the biggest honor a player can earn, yet his jersey #10 remains absent from the rafters of Rogers Arena. When team owner, Francesco Aqulini, reportedly flew to meet with Bure personally, it sparked rumors that the Canucks were planning on retiring his jersey. The team has neither confirmed or denied the story, leaving more room for speculation. 1) He was the team’s first bonafide superstar. He put up numbers that had never been seen by this organization and may never see again. He scored 154 goals in his first three seasons; he was the first, and still the only, Canuck player to score 60 goals in a season, which he did twice. Not only that, but he did it mostly without elite-level linemates. As good as Trevor Linden, Cliff Ronning and Greg Adams were, they were never top-level scorers on par with the rest of the league’s leading-scorers. The only time Bure had a teammate that was equal to his own talent level was when he was reunited with Alexander Mogilny, a former 70-goal scorer in the NHL and Bure’s old linemate in Russia. That was the part of Bure’s career when major injuries started taking him out of action for long periods of time. The two didn’t get to play together very much and when they did, the chemistry that we’d all hoped to see never materialized to a great extent. It was an experiment that didn’t really succeed at the time, but if Mogilny had come in earlier in Bure’s career, they might’ve lit the league on fire. 2) One of the reasons for him leaving was due to the fact that he felt mistreated by management. There were rumors going around that he had threatened to hold out for a new contract during the 1994 playoffs. Bure denied the allegation and felt the team didn’t seem to come to his defense. There were numerous contract disputes over the next few seasons so he asked for a trade. It might seem like an over-reaction but I seem to recall another NHL star player getting his feathers ruffled, and he came out of it relatively unscathed. That player was Patrick Roy. In 1995, Roy gave up 9 goals in a game, taunted fans in his own building, and pulled a Slap Shotesque “trade me right effing now!” stunt in front of a live audience. He left Montreal in a major huff, and yet his #33 hangs from the revered rafters in Habland. The way he departed from Montreal was probably worse than the way Bure left Vancouver, and yet Roy has been immortalized by his original team while Bure has not. If Patrick Roy can have his number retired by the Canadiens after the way he left that organization, Bure can have his number retired by the Canucks. 3) The drama happened a long time ago. Time, as they say, heals all wounds. The Habs forgave Roy, we should be able to forgive Bure 15 years after he got the trade that he requested. 4) He’s in the hall of freaking fame. If he’s good enough to get inducted there, he should be good enough to have his number retired in the city where he established himself as a star. While some will say that a player’s connection to his community should be a determining factor in having his number retired, I don’t think it should overshadow his monumental achievements on the ice. He’s a private person, he came from a different background, he shouldn’t be denied an honor because of his reluctance to be involved outside of the rink. Whether you agree or disagree, I feel that what he did on the ice should be enough to raise #10 to the rafters at Rogers Arena.